Sugar-free. Gluten-free. Chocolatey. Works for me! Au-some Signature Desserts or ASDessertsPH is the answer to my unli-craving for desserts delivered to my doorstep. I tried the keto crinkles and keto truffles, and they were unbelievably satisfying. There’s abundance of dark chocolate taste in each bite. Keto Crinkles 6 pcs per box Php250. The keto crinkles come in a box of six with a dash of subtle sweetness per piece. Let the chocolatey goodness melt in your mouth. I had to stop myself from finishing them all in one sitting and remembered the value of sharing these blessings with my family. One piece per person. The keto truffles come in two flavors: choco walnut and choco peppermint. The choco peppermint is my favorite. The light minty flavor perfectly complementing the chocolatey goodness. Keto Truffle 20 pcs per can Php400. 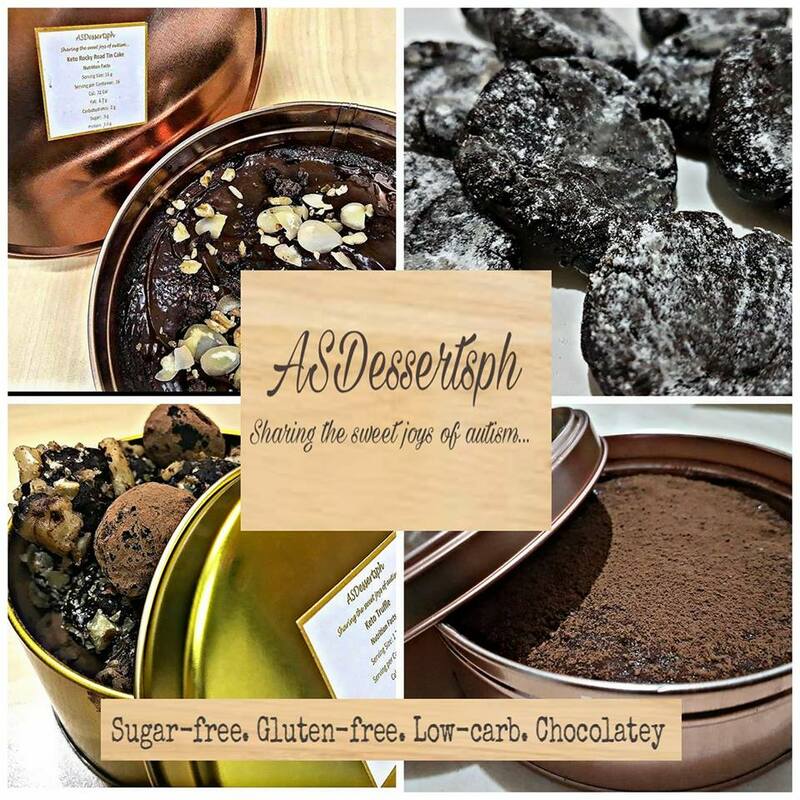 Au-some Signature Desserts, or ASDessertsPH, is an online dessert shop established not just to provide delectable sweet creations but also to advocate awareness on the Autism Spectrum Disorder. Here’s their product line up, all of which are sweetened with stevia/ erythritol. Owner Katherine Borja established Sweet Sentiments that specialized in fondant cakes. Things took a turn when her son, Lance, was diagnosed with autism. She decided to transform Sweet Sentiments into ASdessertsPH where Lance helps his mom create the goodies. Katherine is bent on developing Lance’s skills he can use in the future empowering him the ability to earn for himself by starting small. This is Katherine’s advocacy for autism, and hopefully grow her business to employ more persons with special needs. What happened to the fondant cakes? Well, Katherine became obese when she was still doing regular baking. She couldn’t give up this passion, so she redirected her specialization from fondant cakes to keto goodies that are healthier, sugar-free and gluten free.